The biggest SA Poker Shop! Be sure to visit the biggest Poker shop in SA, opening soon in JHB ... with cash and carry discounts. Submit your details and be the first to know when it opens! APL (Amateur Poker League) - now in South Africa! For decades there have been bowling leagues, dart leagues, pool leagues and now poker leagues. The poker league allows you to test your poker playing skills against other poker players in competitive, organized poker tournaments with dedicated organizers and a points system. The Amateur Poker League (APL) is a group of people who play no limit texas holdem tournament together on a regular basis, playing in freeroll poker tournaments at local sports bars and restaurants. Players compete against one another over the course of a season and prizes awarded. It is free to play in the APL and no wagering of any kind is allowed at any events. 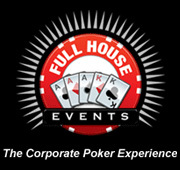 A Full House Events Corporate Poker Experience is the right bet - filled with anticipation prior to the first shuffle and packed full of excitement, thrills and good times lasting well after the final hand is dealt. With the popularity of poker exploding all over the world, companies are fast recognising our corporate poker experiences as a superb alternative to traditional corporate entertainment. Full House Events combines years of eventing experience with professional dealers and experienced tournament hosts while our directly imported quality poker accessories combine to offer a truly original corporate poker experience. 21 Ace - Detailed reviews of popular poker books, as well as a nice section on poker chip tricks. Empire Poker - One of the biggies. Over 40,000 simultaneous players online during peak times. PartyPoker.com - A leading online poker site that offers poker games like 7 Card Stud, Omaha, and Texas Holdem. True Poker - Internet poker room offering multi-player online poker games and tournaments for free or real money. Bugsy's Club - Online poker room of PokerPages.com. Poker Pulse - Features the current game and player counts at many of the most popular online poker sites. Poker Rooms - In depth reviews of top online casinos, as well as a good section of rules on many popular poker games. Imperial Poker - A new online poker site. RoxyPoker.com - Multi-player online poker room that is part of the world's largest online poker network. Poker Press - Compares some of the top online poker rooms, as well as provides news and educational information. Online Poker Room Reviews - Details and compares many of the leading online poker sites. Cruzino.com - Extensive directory of Internet information on game rules, gaming books, and other gambling related resources. Gambling Info Sites - Directory of valuable gambling information web sites. Online casino sites are separated out for faster browsing. PokerChipsGuide.com - Directory of retailers and other poker resources. PortalPoker.com - A to the point directory of poker related links. PokerPistols.com - Directory of online poker rooms, strategy tips, poker tools, and rules for various poker games. Poker Portal - An extensive categorized directory of poker related links. Texas-Holdem-Online.info - Directory and comparison site of online poker rooms. Pokerschool Online - Paid service that offers weekly lessons, tests, play-money tournaments and ring games, and more for beginning and advanced levels. Casino Poker Rules - Comprehensive rules for numerous poker games. NetBet.org - Concise FAQ on online gambling. Poker Mentor - Learn strategy using data mined notes on 100,000+ poker players, a fish list, indepth articles, hand history analysis, and preflop strategy sheet. Paragon Poker Pal� - Leading poker odds calculator software. Card Player Magazine - Well-written, interesting, accurate, and informative magazine that will tweak your poker interest, knowledge, and attitude to make poker more enjoyable for you. Poker Press - Online news site covering the pro circuit events. ConJelCo - A leading gambling book and software publishing company specializing in products for serious gamblers. Rec.Gambling.Poker Newsgroup - Provides free web-based access to the Rec.Gambling.Poker Newsgroup, the premier poker discussion groups. TexasHoldem-Poker.com - Texas Holdem strategies, online poker rooms, and Hold Em resources. ThePokerForum.com - A comprehensive poker information source that includes: lively discussion groups, tournament info, rules, articles, book reviews and more. .Bingo.com - Online bingo portal that includes free online tournaments, articles, reviews, a glossary, links, a search engine, and a directory. Drinkstuff.com - Home to all Gadgets, Gifts & Bar Stuff related to booze. AnteUp Gambling - Casino gambling links, articles, and reviews. This site is a little busy, but there's some good articles once you weed through all the noise. Home Poker Games - Postings of home games looking for players by state. Site also includes online poker site reviews, and other poker and gambling info. SeriousPoker.com - A full compliment of web resources for serious poker players. Play Winning Poker - Steve Badger's site that aims to help those willing to do the work (studying and applying strategic concepts) be winning poker players. PokerPages.com - A leading community/portal site with searchable database of poker rooms, daily-updated events with results, live-audio broadcasts, articles, seminars, tips, player profiles, and discussion groups. Poker FAQs - Comprehensive poker resource covering a multitude of frequently asked questions. LowLimitHoldem.com - Poker strategy and tactics advice geared towards beginning and intermediate Texas Hold'em players. Flop Turn River - A well organized no limit Texas Holdem strategy guide featuring: play-by-play examples, poker chip tricks, strategy essays, and hints, tactics, and advice on playing online. Casino Poker Rules - Guide to how to play many poker games. Includes online casino poker rules and strategies, poker news, terms and tips. GamblingSmart.com - resource for online gambling information and guidance, including casino games and online gambling strategies, free casino games, casino and sports book reviews, and much more. PokerCheckRaise.com - A guide to beating Texas Holdem online that is written by professional poker players. Texas Hold�em Strategy - A comprehensive resource page that provides Texas Hold�em poker strategies and tips to get your game in shape. Online Wagering Guide - Online casino and sportsbook guide. Includes gambling news, free games, casino reviews and player comments. HoldemPoker.com - Texas Hold�em rules, strategy, hand statistics, and listings of contact info for Las Vegas casinos with good poker rooms. WSOP2005.com - History of the World Series of Poker, as well as general tournament strategy. Mike Greenberg's Poker Strategy - Quick to the point strategy pointers from an experienced player.